It’s been a busy summer for us at Amplitude. In this release: co-owned dashboards, better funnel insights, and more. It’s been a busy summer for us at Amplitude. Below is a summary of what’s new in the product. Ever wanted to collaboratively build charts and dashboards with your coworkers? With co-ownership, several people can each make changes to a shared chart or dashboard, just not at the same time (you’ll get a friendly warning if you try). Ever wonder how many times your users take a certain action before they convert? With Frequency in Funnels, you can now view the distribution of the number of times your users do a behavior in your product before performing a key action! 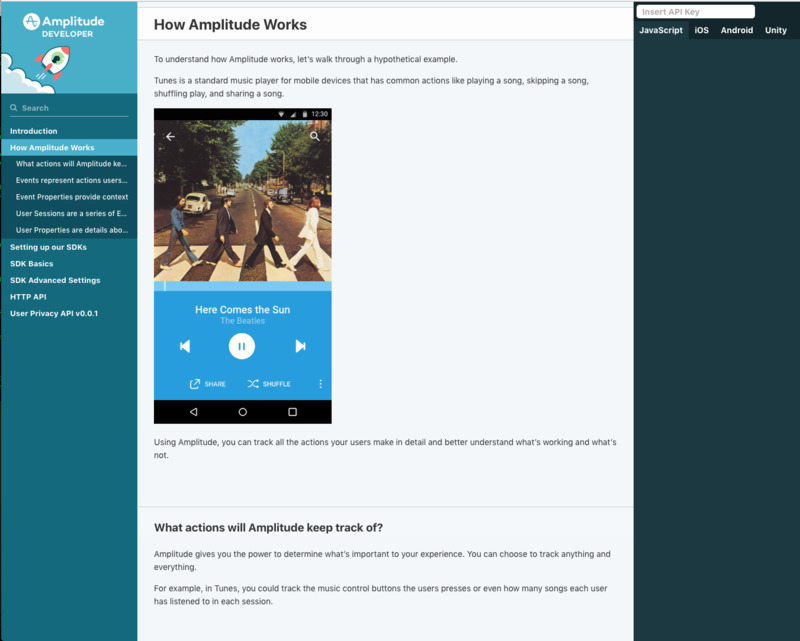 We launched our new developer center, a single destination for developers to learn about Amplitude. It contains a quickstart, information on setting up our SDKs, and API documentation in an easy to use interface that includes code samples in multiple languages. It can be difficult to understand how to efficiently batch and partition your event data to maximize throughput. Many server-to-server implementations encounter throttling errors when sending events at high rates. Today we’re releasing a new batch ingestion pipeline to improve throughput and reduce the likelihood of running into throttling errors. With this new pipeline, each API key can send up to 1,000 events per second per device id or user id. The new endpoint also provides richer error messaging including identifying offending devices in the event of throttling errors, allowing you to make better decisions about which events to retry. Take a look through our documentation to learn more. Have you ever had to recreate the same dashboard for different customer accounts, countries, platforms, or other user properties? You can now do it with just a few clicks by picking a user property filter to apply to each of a dashboard’s charts. Some limitations: bulk filters are additive (you can’t remove existing chart filters), it only works for dashboards where all charts come from the same project, and clicking into a chart still shows you the original chart without the bulk filters applied. Week definition and timezone discrepancies are frustrating, we know. If your organization defines a week as starting on a day other than Monday, you can now match that definition in Amplitude. Moreover, timezones are better supported by the datepicker, so “today” will match up with today in the project’s timezone more reliably. You can now choose to add an offset to a chart’s date range. If you’d rather not display the most recent data until after it was had time to cure, you can select your offset and apply it using the date selector. Period-over-period comparison is now available for realtime charts as well. That means if you want to compare today’s hourly activity to the same day last week’s hourly activity, you can do that with just a few clicks! You now have the ability to look at percentages on lifecycle charts instead of user counts. It helps you better compare new/churn/resurrection rates across intervals that have different numbers of users. You can now filter users by how many distinct values of a user property they have. That’s a mouthful, but it’s also super useful. For example, in the Event Segmentation chart, there is a new property metric for “distinct property values per user” that you can use to answer things like how many shows users watch on average or how many different items users view on average. In cohorts, there’s a new condition on “performed event” clauses that lets you filter by “distinct values of property” which can, for example, let you narrow down on users who used more than 3 devices. Chart annotations allow you to display noteworthy events in Amplitude, such as releases, holidays, or big marketing campaigns. Previously, all annotations were global, which quickly became unruly at larger organizations. Now, you can specify whether an annotation should be applicable to all charts across the organization, or only to the chart you created it from. 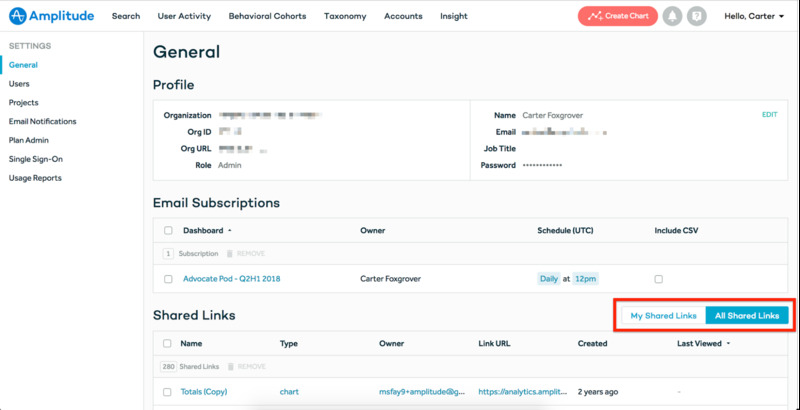 Shared links enable admins and managers to share dashboards with people outside of the organization. Manager and Admins can now see and remove shared links, or disable the capability for their organizations.